Review: Chances are if the premise of a film that is centred on two guys who are resorting to robbing banks as a means of financial support, you’re unlikely to want to see these guys get away with their crimes and you hope that the full justice of the law catches up with them. You think the crooks are the bad guys and the law is the good guys? Well yes and no is the answer to that in the case of this enthralling crime heist movie with a modern Western vibe. Toby (Pine) and Tanner (Foster) are the criminals in question, brothers who have remained close even after Tanner has had some spells in prison. The pair are in severe financial trouble and so in their desperation, they hatch carefully hatched plans to rob some local banks in order to stay afloat. However their deeds unsurprisingly begin to attract unwanted attention on their part and it is up to a Texas Ranger, played wonderfully by Jeff Bridges to investigate and foil their schemes. The script from Taylor Sheridan, who also wrote last year’s Sicario, is absolutely tremendous. The winner of the 2012 Black List, it certainly borrows elements from movies in this genre. It is hard to not see the very obvious comparisons to the Coen brothers’ No Country for Old Men. That being said, it certainly holds its own as an excellent and riveting piece of storytelling. Though the brothers are far from perfect human beings, one certainly being far more unlikable than the other, it does a splendid job of making you want to root for these guys even in spite of the crimes they’re committing. Even when the rozzers soon start to piece together their investigation, there is a dilemma, as to whether you want the coppers to catch them or hope that they get away and rebuild their lives. Pine and Foster are excellent in their roles. You buy their chemistry and even though it is clear Toby has a few misgivings with Tanner, their relationship and love for each other as brothers is absolute. Pine in particular has made his name as Captain James Tiberius Kirk, but here he arguably gives the finest performance of his career. Yet more could have done to flesh out and give bones to the brothers’ back story, as it could have been touched upon in a bit more detail. Bridges, in a very similar role to his eye patch wearing, half mumbling performance as Rooster Cogburn from the 2010 remake of True Grit, brings his very unique and very funny sense of humour to his role as the Texas Ranger, even if he is a bit hard to understand in places. The back and forth between him and his partner (Gil Birmingham) certainly provides the laughter. Yet it is the leading men who undoubtedly steal the show and don’t be surprised to see potential award nods come their way. After directing Starred Up, David Mackenzie does a tremendous job of bringing this gritty story from Sheridan’s screenplay to the big screen. The cinematography is majestic with some tremendous wide and panoramic shots of the Eastern New Mexico landscape, cleverly doubling up as Texas. These are fused brilliantly with the scenes that take place in the town. In addition, the bank robbery scenes are masterfully executed, ensuring the tension and suspense is maintained right throughout. The movie does lag in parts as it is a slow paced film, the cat and mouse chase that ensues from the first bank robbery scene combined with brilliant performances and a first rate score. All of the aforementioned elements ensure that the film stakes its claim as an awards contender as awards season starts to come into view. Tremendous performances from Foster and Bridges, with arguably a career high from Pine, combined with a tense and superbly written script. 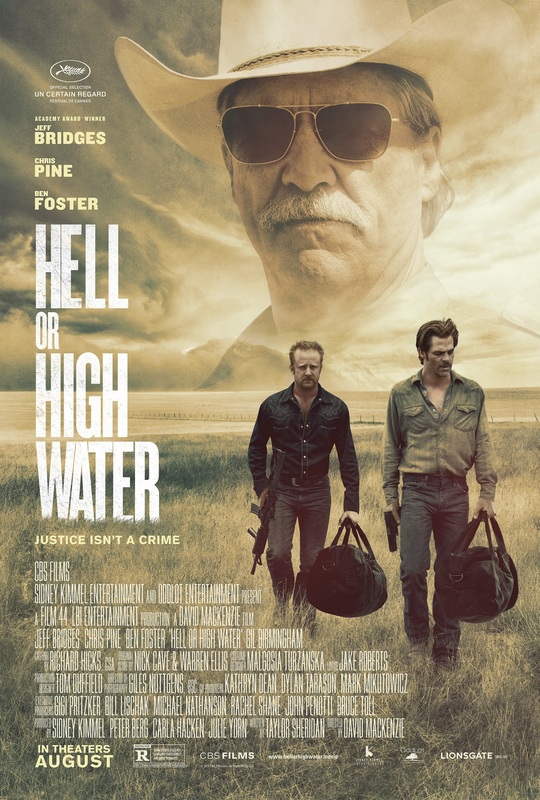 Come hell or high water, you should definitely see this film!